Over the past several months, my blog readership has been slowly increasing. Some of you have asked what I’ve done in order to increase my blog readership, and asked for suggestions of what you can do in order to increase yours. Back in March, I wrote about the tools that I’ve been using to help support my more consistent blog writing. But its not just about what I’ve been doing on the blog, its also about how I’ve been interacting with other bloggers. 1. I’ve been blogging consistently since February. For the past three and a half months I’ve been blogging consistently five days a week. This hasn’t been easy, and its taken a lot of focus, diligence, and dedication to make it happen. Prior to making this change, I wasn’t blogging consistently at all, which made it difficult to build up a loyal reader base since my readers didn’t know when to expect a new post from me. As summer approaches, I know that its going to be more and more difficult to keep up with this blogging schedule, but I’ll certainly be doing my best to maintain as consistent a posting schedule as possible. 2. I’ve been making an effort to comment on more blogs. You can’t expect to increase your readership if you aren’t reading others’ blogs, and one of the best ways to make your presence known is to comment on others’ blogs. Not only does it get your name out there, but blog etiquette says you should visit the blogs of those who comment on yours. While I certainly try my best to do this, there are days and weeks when life is just too busy to visit every single blogger’s blog who has commented on mine. 3. I’ve been participating in a weekly Friday Five linkup. 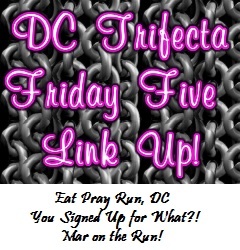 Thanks to the wonderful ladies of the ladies of the DC Triecta (Courtney, Cynthia, and Mar), I’ve been participating every week in the Friday Five linkup. Some weeks there is a theme, others weeks there isn’t, but through my participation in the linkup I’ve had the opportunity to connect with new bloggers and expand my blog reading list. 4. I’ve been Tweeting “in case you missed it” posts. Each week, I schedule “in case you missed it” tweets through HootSuite for throughout the week, reminding readers of some of my blog’s most popular and most read posts. Not only does this allow readers who have been around for awhile the opportunity to read a potentially missed post, but it also exposes new followers to posts that they may not have read yet. 5. By connecting my Facebook posts to Twitter, I’ve noticed a slight increase in Facebook activity, which is just another media forum through which to promote my blog. Although Facebook is constantly changing its ways that posts get exposed on News Feed pages, which many bloggers are upset about, I haven’t given up on Facebook yet. Each time I post on my blog Facebook page, a tweet also gets tweeted out, which is additional promotion for my page. It also gives readers multiple opportunities to see posts that I’ve written. QOTD: What have you done in order to increase your blog readership? This entry was posted in Miscellaneous and tagged blogging, blogging tips, Facebook, Friday Five, HootSuite, social media, Twitter. Bookmark the permalink. Great tips, thanks for sharing! I’ve definitely found that commenting on other blogs is a great way to get more readers but also a great way to actually feel like you’re more a part of a community and not just talking to yourself! I haven’t checked out hootsuite yet but it’s on my list of things to do. “In case you missed it”…genius! I never remember to schedule my posts so I do it manually when I can. That can get tricky when I’m at work because I don’t always post at the “right” time. Thanks! That can get very tricky. I schedule most of my tweets related to my posts after I finish writing them. I definitely don’t have the time to sit down and work and tweet all of my tweets that go out! You’re completely right about the consistency thing. When I was more consistent with my posts, I had more activity on my blog. Since my consistency is lacking these days, so are my reader’s interest. 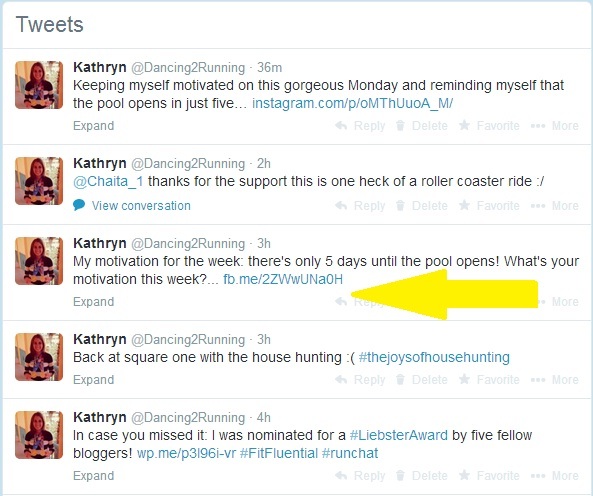 I love HootSuite for scheduling posts! I have also found that Pinterest has helped. I often pin my workouts there and that brings a little more traffic to my blog as well. Sounds like you are on the right track! I wish you the best of luck during the summer…I know I will need it too with the kids here! I try to remember to post my blog posts to Pinterest, but some days I just forget. I wish HootSuite and Pinterest connected with one another. I totally agree with all of these–I’ve done much of the same. Also, don’t forget how much getting involved in various ambassadorship programs and networks has helped! Absolutely! The Sweat Pink and Girls Gone Sporty Ambassadorships have been invaluable! Thank you for introducing me to that little “schedule” button! 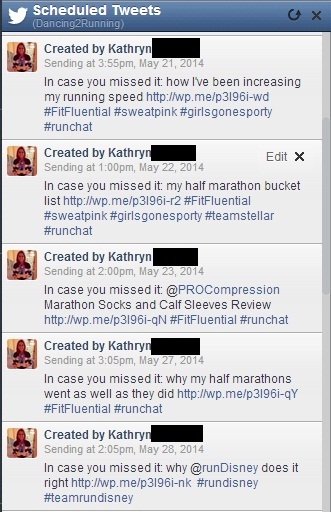 How do you link your FB posts to Twitter? I know it was an option when I set up my FB page for the blog, but after a couple of minutes of playing around with it I can’t find that setting option. Maybe Facebook help will be of assistance? this is great! We love hosting the linkup but consistency is definitely key. I also found when i went self hosted I had more options for promoting, and ability to use plugins, etc. it’s not for everybody but given where I was before i did it, I can see how I’ve benefited. I’ve started looking into self hosting, but I’m far too busy right now to consider making the transition. Maybe once things slow down over the summer? I’ve been doing the same thing you have been doing, and my readership has increased A LOT since February. I haven’t been linking up though, till today. Hopefully that gets more readers. Also, I noticed that participating in Twitter Chats exposes you to new readers as well, so there’s a hint. I LOVE LOVE LOVE the twitter scheduler on Tweetdeck. Even when I am away, I can tweet and no one will be the wiser. Its so easy to set up, Mindy! Commenting and interacting with other bloggers is part of what makes this an incredible community! I discovered your blog about a month ago, and I think one other plus you have is you post great content! Wow, All these bloggers have given great idea. I still need to learn to use that Hoot Suit you talk about. I looked into it once and found it quite confusing. Maybe I just need to concentrate on it a little more. I also heard there is a similar program but I don’t know what it is called. also, don’t feel bad about not posting 5 days a week during the summer. Our blog posts have already started to slow down to 4 days a week and we are considering going to a M-W-F schedule. We will see I guess! You are doing a great job on your blog! Thanks for the support. I assume that many readers schedules are just as busy as mine tends to be over the summer, leaving less time for them to write what I write anyway. And yes, you need to check out HootSuite! It’ll save you so much time once you’ve mastered it! Great tips Kathryn. I also love what Gigi wrote in the comments right above mine! She definitely has some great ideas! This is so helpful! Thank you for putting it out there! And, I agree with above posters about your great content! Consistency is a hard thing to do…but you’re so right that it’s absolutely worth it! I love our linkup because I’ve gotten to know people throughout the weeks and have found new fave blogs through it! Great tips! That’s one of the reasons I love the linkup as well! Thanks again for co-hosting it every week! Great tips, may steal the “in case you missed it” idea. I can’t take credit for the idea, but I’ve definitely noticed how powerful it is. I’ve been trying to post daily, however, life (aka my job) gets in the way….but that is changing next week so here’s to daily posts! I hear ya about life getting in the way. I wish I had more time to consistently comment on other blogs, but its difficult some days, especially if its been a long day at work. I use a plugin that tweets old blog posts. That seems to help too. It varies from post to post and day to day. Sometimes I see a couple of page views when I retweet an old post, and sometimes I see tons. Didn’t even know you could schedule tweets! Thanks for the info. I’m curious, do you use ig to promote specific blog posts and not just your blog page in general. Just was wondering if you used ig in that manner. I don’t promote blog posts on IG as much as I probably could/should. You can’t schedule IG posts in advance so that makes it a little more complicated. I love this post! You have inspired me t start leaving comments on the blogs I read- therefore, leaving one for you as well! great blog!